At the BBQ my roommate KC hosted a couple weeks ago, his friend marinated and grilled some chicken that turned out quite well. Since I had a handful of lemons and some cilantro on hand, I tried to recreate the magic, or at least approximate it. At least a few hours before cooking, marinate the chicken with all the rest of the ingredients listed above and then store it in the refrigerator. Toss around the container with the chicken periodically, so the marinade is evenly distributed. Once it’s time to cook, throw the chicken onto a nice, hot grill. Alternatively, if BBQ flavor (i.e., carcinogenic char taste, yum) isn’t your thing, you can also roast the chicken. Preheat the oven to 375 degrees, and then roast the chicken until done, about 25-35 minutes (at about 350 degrees – and my oven runs on the hotter side – it took about 30 minutes for the chicken to turn out just right; I also flipped the drumsticks over once). P.S. It turned out great! I might make it again this week, but with limes next time. I might also try roasting some vegetables underneath the chicken, to collect the juices that drip down, a la the Roli Roti potatoes underneath the rotisserie porcetta. KC’s friend used limes and a bunch of spices that I don’t remember, but this recipe is more of an art than a science. He also used Frank’s RedHot Buffalo Wings Sauce as one of the main components of his marinade, but I didn’t want to use an ingredient that I wouldn’t typically have on hand. -Wednesday, February 22, 2012: SOC was in town for the first time since the move; this time, I used limes instead of lemons and concluded that I prefer to use less-tart lemons for the marinade. Also, we roasted slices of potatoes underneath the chicken, and those turned out great, even though they were a bit tart from the lime juices that collected at the base of the pan. 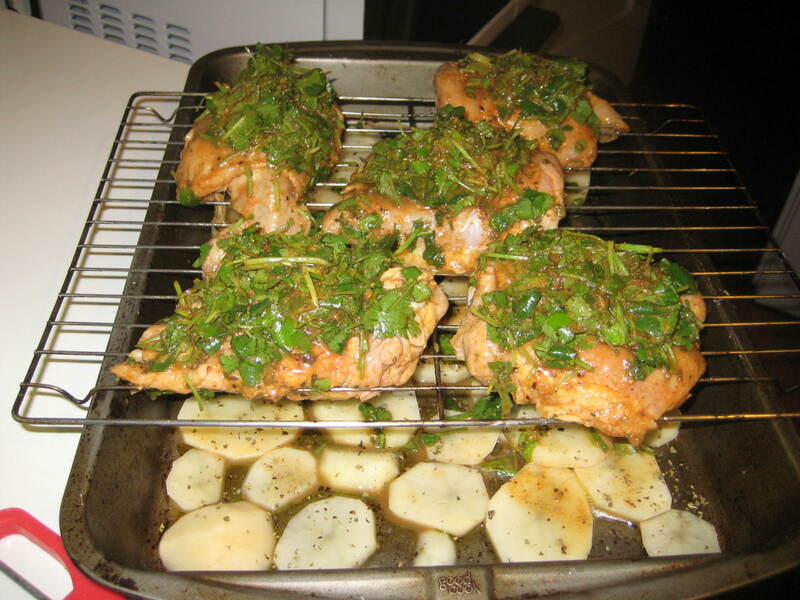 This entry was posted in American, Main Dish, Recipes, Side Dish and tagged BBQ, Chicken, Cilantro, Lemon, Lime, Marinating. Bookmark the permalink.